As commander of Autobot City on Earth, Ultra Magnus commands the most powerful forces ever assembled, of which he is among the greatest. He was given the honor of City Commander by Optimus Prime because of his superior intelligence, and incredible might as a warrior. Since taking command he has defended the city against dozens of attacks by Decepticons led by the crafty Skywarp. For his part, Skywarp is determined to breach the city�s defenses and destroy Ultra Magnus in order to prove himself to Megatron. A nice blurb, if it is a pity that neither character receives their own bio. This set has been highly anticipated since images first surfaced online. This is hardly surprising, given Skywarp�s inclusion. As a cult classic, any figure based on Skywarp�s G1 incarnation sells like hotcakes, so it should be little wonder that the glorious Classics Seeker mold is no exception. However, the repainting of Optimus Prime as Ultra Magnus has long since grown old. With Dreamwave to thank for the series of repaints (four to date), the whole affair has a tired feel for many fans. Thus, it was a terribly shrewd move on Hasbro�s part to package Skywarp and Magnus as a limited edition exclusive set � if more than a little frustrating for some! Still, do these repaints warrant the price some charge � or even the RRP? Well, you have to undo around 25 twisties to find out (and that�s before you get to those elasticised plastic string things!)! Rather irritating� Let�s explore whether it�s worth the time, effort, and dosh. Ultra Magnus has received identical tech-specs to his G1 counterpart � which is nice, but I�ve always felt he was rather cheated in the strength and courage departments. Still, they give the perfect image of a competent warrior � nothing special, but reliable. He�d certainly follow orders without question, but I feel he�d show little initiative in a novel situation. I really think the apparently close relationship between Prime and Magnus is the true reason he was put in charge of Autobot City. But, anyway, we�re not here to discuss the nuances of Ultra Magnus�s character! What about the figure? Being the most dubious of the duo, and also the larger of the two figures, he�s really gonna make or break the decision to buy. 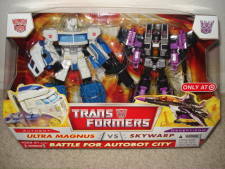 It�s no secret that the Hasbro stock images for both Ultra Magnus and Skywarp differ from the actual release � however, Ultra Magnus bears the brunt of this, with a significantly divergent paintjob. The result is either a good, or bad thing, depending on your point of view (as ever). 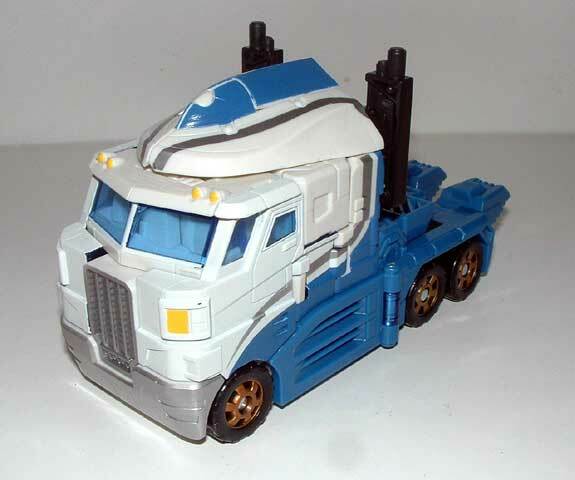 Measuring just over 6� (almost 16cm) bumper to bumper, Ultra Magnus turns into a semi cab. This may seem slightly small for a Voyager scale figure, but as pointed out by Knightdramon in his review of Classics Optimus Prime (the original release of this mold), he gains a lot of height through the ingenious transformation. The cab is a very clever update on the G1 Prime / Magnus alternate mode. For whatever reason, I feel this mold suits Ultra Magnus better than Prime. Crazy as that sounds. Following the sweep of the blue is a curved silver line � giving the cab a very contemporary feel in combination with the angular, yet curved shape of the machine. It�s just a pity the silver lines don�t join with those on the wind vane. Silver also picks out the bumper and grill, giving a far more authentic look to Magnus�s vehicle mode, than with Prime. Yellow is used to highlight the headlights and parking lights, while the exhausts are both a solid black, which contrasts nicely with both the white and blue. Windows are transparent blue, which works well with the whole. The rub sticker is located on the right-hand side, under the door. My favourite touch, though, has to be the bronze alloys � they really set the whole ensemble off! Molded detail is superb, with lines matching with the many separate parts � including the wind vane. Given the sheer number of parts involved in the transformation, this is no mean feet. It�s also worth noting that very little of the robot mode is given away, even on the underside (which only reveals the thighs, and a rather empty area where an engine ought to be). I live on a major trucking route in Scotland, and spend a lot of time on the road anyway, as part of work, and this cab does not look like any which menace my rear mirrors, while at the same time resembling them all. In a sense, the designers at Hasbro have created a generic modern cab, full of style, while keeping that �70�s / �80�s feel. Certainly a top notch alternate mode (and you do always have the choice between Prime or Magnus depending on your personal preferences). Ultra Magnus�s transformation is amazingly fun! He�s one of those transformers you just have to keep on playing with � which surprised me very much. I think he runs a close second for my favourite transformation, tying with G2 Clench. Not that there�s anything in common, and he is rather more complex than my favourite � the Armada Overload mold. It�s just so perfectly thought out, and, well, great fun! What�s more, there�s no end of ways to display him. The wind vane becomes a large cannon � which is fun, but there�s always the option of leaving it as a sleek streamlined back (which hides the truck�s radiator grill). You can choose to attach the exhaust stacks to the wind vane / back, or these can also be converted into a menacing rough and ready laser rifle! Standing around 7� (18cm) tall, he�s still not the largest Voyager ever, but he is a respectable size, and looks down on Skywarp (who has taken over nemesis duties from Galvatron�). It is the robot mode that diverges most significantly from stock photos. Thankfully, the bright baby blue is absent, and the deep blue has been replaced with a paler shade. 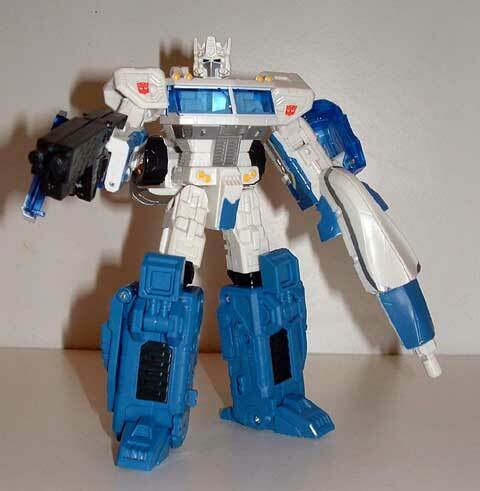 The extensive use of blue for the lower legs gives a radical new look to trusty Ultra Magnus! The head has lost the deep blue mouth plate that has been present in all previous versions of Ultra Magnus (as an inner �bot or Prime repaint). Instead, his mouth plate is silver � and only over a �T� shaped section, leaving the under part white on either side. This gives a rather novel look to the fellow, and seems to alter the mold�s persona � taking it a few steps away from just another white Prime. The eyes are blue (with good light piping), rather than the orange so often used. I�ve always felt that previous Magnus repaints have been rather intense and edgy, due to these eyes and dark mouth plate � at odds with the character. The setup here gives the impression of a far more serene and collected countenance. The detailing is beautiful, and far less garish than on Classics Optimus Prime. Also, Magnus receives Autobot insignia over his shoulders � a lovely touch, that does not interfere with his disguise. The overall impression is of an amalgamation of all previous Prime molds, which somehow ends up lending itself brilliantly to Magnus. Articulation is phenomenal, with around 17 meaningful points, and, with superb balance, this guy is infinitely displayable and fun! There are few negatives � the chief being that poor paint application common to the entire Classics line (�The Curse of the Classics�), and the rather cumbersome cab sides to be found on his forearms. Still, these issues are inconsequential when measured against the greatness that is Ultra Magnus! So � if you are to have one white Prime Ultra Magnus, this is that one, and if, like me, you feel Classics Prime is rather garish, then Ultra Magnus here will gladly bring honour to your collection! As with Ultra Magnus, Skywarp has been gifted with the same technical data as his G1 release. This was, as far as can be discerned, switched with Starscream. He easily outdoes the Decepticon Air Commander in every respect � including rank! An odd profile, which hardly reflects his G1 persona. Still, he was a fun character, with an amazing paintjob, and he has attracted something of a cult following within the Transformers fanbase. There is little doubt that most of you have been attracted to this set by the repaint of Classics Starscream in Skywarp�s colours. Starscream presented a perfect and affordable toy representation of the G1 Seeker, and there is little doubt that the mold can serve just as well for Skywarp or Thundercracker � and altered for Ramjet, Dirge or Thrust. But, of these, Skywarp would always be the best seller � and will likely be responsible for moving this set off the shelves, despite Ultra Magnus�s greatness. Skywarp has only minor paint application differences when compared to the stock photos. Most of these are definitely positive in their effect, as they leave the figure uncluttered, yet still more detailed than Classics Starscream. In addition, the stock photos (including the packaging) show a transparent orange square on the nose of the plane (which looks rather tacky). Do not fear! The designers have resolved this problem on the actual toy, and painted over the clear plastic with a solid black paint, matching with the rest of the fuselage. 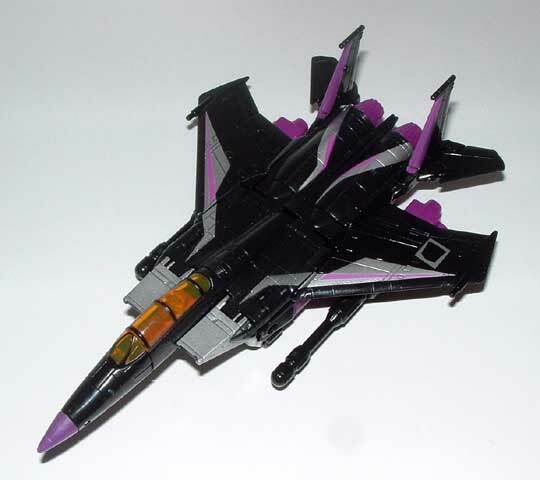 Being an original G1 Seeker, it should come as little surprise that Skywarp�s alternate mode is a stylised F-15 jet fighter. Measuring 7 �� (19cm) from nose to tail, while sporting a 5� (13cm) wingspan, Skywarp is a sizeable opponent for Ultra Magnus. The black base plastic looks a lot nicer than the dodgy silver plastic used on Starscream. As all silver detailing has to be painted over this, the overall effect is much nicer. 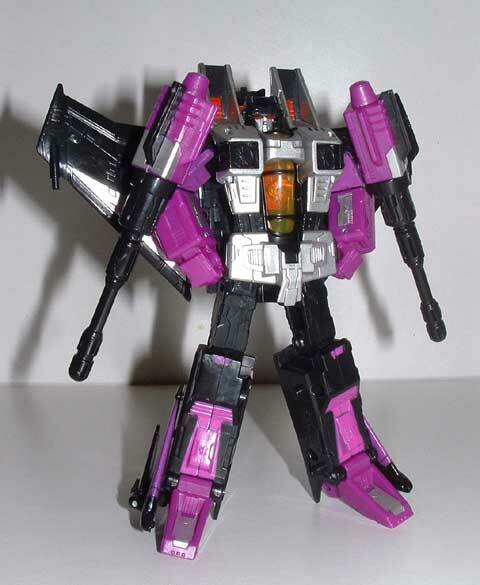 Skywarp�s colour scheme is far less divergent from his G1 release, with silver and purple stripes along the wings, and purple used for the nose and afterburners. The striping has been continued along the afterburner housings, which is a nice touch � actually improving on the G1 design. The inversion of the purple and black on the tail fins is also a clever change, giving a more consolidated feel to the jet. The black fuselage also allows the head to disappear... Unfortunately, Skywarp is not untouched by the Curse of the Classics: Not all paint applications have been executed well, but my toy is perhaps the least affected Classics figure I own. Skywarp has a far more orange canopy than Starscream, which goes beautifully with his more intimidating ensemble. The requisite rub sticker can be found on the left wing, as with Starscream � but, at least with my figure, this sticker has been far more carefully applied than with his predecessor. Of course, the mold is still a mess from the underside, although the silver ties things together a little better than the red on Starscream. The cannons are rather loud, with the launchers molded in purple plastic with silver detailing and oversized black missiles. However, this is the most displayable and enjoyable Seeker mold, and Skywarp�s jet mode far outstrips Starscream for coolness! The Classics Seeker mold transformation is a slight departure from the G1 version, providing improved articulation, proportions and a solid back! The resulting robot stands 5 3/4� (15cm) tall, and is the spitting image of the G1 animation mold. As with the jet mode, Skywarp surpasses Starscream, with more detailing, and a far more intimidating look. He just screams G1! Luckily, there is not quite as much random purple detailing as the stock photos show, and the upper arms are black on the side, rather than purple, giving the gauntlet forearms greater definition (an improvement, in my opinion, on Starscream�s blue sides and undifferentiated gauntlets). The shoulder turrets look fantastic with the red grid details on a black background, and a silver outline. In fact, it seems a lot more thought went into Skywarp�s colours, and the result is well worth it. The head deserves particular praise. Being an identical scheme to Starscream, the two could not be more different. Based on black plastic, the face is a shiny silver, and the eyes are a solid and perfectly applied red � as opposed to Starscream�s silver-grey plastic base, with thinner black and running eyes. As a result, the beauty of the head sculpt can be fully appreciated. The only negative to be found at all is in the purple launchers, which do look a little garish again. But, honestly, that�s just nitpicking. 19 points of articulation (excluding missile launchers) adds to give an exceptionally fun and displayable toy. Skywarp is not only the highlight of this great set, but also of the entire Classics line (to date)! 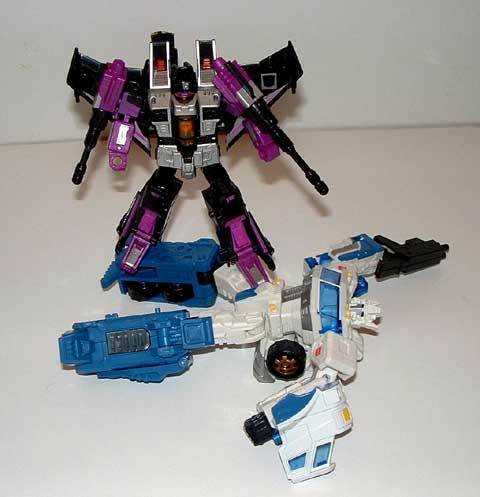 Transformation: 9 � Both figures have superb transformations, although Skywarp�s disguise suffers on the underside. Durability: 8 � Both seem solid, although Skywarp has many worryingly stiff joints, and could suffer from the same problems as Classics Starscream. Fun: 10 � This is an amazing set! Both figures are excellent re-imaginings of their G1 counterparts, with a story thrown in to boot! Plus, in my opinion, they both surpass the original releases of these molds. Price: X � This set varies wildly. As a Target exclusive, many people are cashing in on the desirability of Skywarp, and charging up to �60 ($118) to us fellows in the UK. I would never have paid more than �30 ($59) (and was lucky to get it for a few quid less, inclusive of postage). The US shelf price of $19.99 (�10.18) is a steal! Even if (or when) a UK store picks this set up as an exclusive, we will never see such fantastic prices as the States, and can expect to pay between �25 - �30 shelf price, at my guess. Overall: 10 � I�d say this is the apex of the Classics line to date (bar Bumblebee, maybe). The molds are both superb, and the paint jobs perfect. If you can find them for a sensible price, you�d be foolish not to pick them up!